Purefecto: If you want to vacation without paparazzi, this is the resort to go to! If you want to vacation without paparazzi, this is the resort to go to! If you are one of those people who gets haunted by paparazzi, the place to go relax without people asking you for autograph is The Brando in South Pacific. This resort is actually fairly accessible from Los Angeles. You have two options. One is take Air France/ Tahiti Nui from Los Angeles to Tahiti, then transfer to The Brando via Air Tetiaroa. Another option is fly private to Tahiti ($100K and up) and then transfer to The Brando via Air Tetiaroa. Unfortunately the airstrip at Tetiaroa will not accommodate private planes so there is no way to fly direct onto the atoll. With that said, Air Tetiaroa lounge is gorgeous and is air conditioned unlike rest of the Tahiti airport which can get rather hot and humid. The flight is short from Tahiti... it's only 20 minutes so you land pretty soon after you take off. There are only two places I've been to that does arrival perfectly. One is Amanbagh. The other is The Brando. I love it when you arrive, the resort sets the tone via music/ dance. At The Brando, they have one girl singing and playing ukulele while another doing traditional French Polynesian dance. As far as I'm concern, every top resort should do something similar to set the tone for their guests. We were whisked away to our room once the performance ended via a buggie. Unfortunately, this was one of the very few complaints I had at The Brando. They mixed up our room as we had extensive email chains requesting turtle bay instead of mermaid bay room. At first front desk blamed it on concierge but when confronted with email chain from reservation department, they finally admitted fault. That's unacceptable as front desk should have just admitted fault from the get go instead of trying to blame it on someone else. That's not the way to endear anyone who just checked in and certainly not the way a resort that's ranked number two in the world by Conde Nast should handle things. I know when we had a problem with our room at Eden Rock, it was handled professionally and the manager made it more than right for us. But then again, maybe that's why Eden Rock is named number one by Conde Nast. With that said, rest of the stay was pretty much close to perfection with one or two things I feel they can improve upon. After finally checked into a villa on the turtle bay (couple hours later), we were able to enjoy the resort. The photos on their website do no justice to their villas. I would say the interior finishes is second to Cheval Blanc Randheli. Everything is very nicely done. The ceiling is quite high and everything down to the color scheme was spot on. The only minor quip I have about the interior is the reproduction painting they have hung across from sofa in the living room. I mean at this price point, why should I be looking at a reproduction art? Why not just frame up some dead palm leaves from outside. That would look so much better than a canvas with printed art. I would not be surprised if they bought that canvas from Art.com which is a no no at this price point. Other than that, all the finishes were topnotch and very French. The bathroom is especially beautiful. While I don't think the round pedestal sink is my thing for long term use, short term is very doable. The layout of the suite is very functional. You have living room area right off the entry. If you head to the left, you have a study/ reading area that can be enclosed with a sliding door. This is particularly useful is you bring your kids as the daybed has a pull out underneath that can be used for your kids to sleep on. If you turn right at the foyer, you will enter the bedroom area. The bed is nicely centered for optimal viewing of the sea. Behind the bed is closet area where they have ample closet space and drawers for a week or two stay. Passing through dressing area is a gorgeous bathroom. Unlike Four Seasons Bora Bora, you only get one bathroom unless you check into a two bedroom villa. So if you come with your kids and decide to stay in an one bedroom villa, all of you will have to share one bathroom. I do have to note one great design element of the villa is night light. They installed an infrared light under your bed. When you get off your bed to go to bathroom at night, small light will come on inside your bathroom as your feet would have trigger the infrared light. I thought this is clever and eliminate leaving a nightlight on all night. Every villa gets their own private sandy backyard which is quite nice. In this backyard they have outdoor foot and overhead shower. There is a nice shaded gazebo like structure for you to take in your meals. There is also a smallish pool for you to dip in in case you decided you didn't want to trek to the ocean which is only a minute away. There are some foliage that give you some privacy between the public beach and your own backyard. But honestly, with 35 villas and only about half of them are on the turtle bay side, we barely saw anyone. Some days, we were the only one snorkeling in the reef. Actually make that pretty much everyday. Sometimes you wonder where is everyone?? My type of beach for sure! This is suppose to be a eco-resort so with all these gorgeous amenities, how can this be green? I've been to a few of these eco-hotels before and they just feel... well, not luxurious at all. But at The Brando, they managed to achieve luxury AND eco-friendly. Not an easy feat. Air condition which is an absolute must in a tropical resort came from deep under the ocean. Most of the electricity came from solar panels and down to the toilet water is of ground water/ rain water. Now I'm not a big fan of looking at my toilet and water is somewhat yellow....makes me want to flush it till clean water comes out. But in this case, since it's saving the environment, I will temporary suspend the germaphobe self. The food here is not as good as Cheval Blanc Randheli, but they are definitely better than Four Seasons Bora Bora. In fact, the breakfast here is better than Cheval Blanc Randheli. The croissants all came crispy and they give you just enough food without overwhelming you with it. This is the first place I have ever been to that actually is able to give you good bake goods in a tropical setting. Eden Rock's soggy croissants pale next to The Brando's. They need to keep the pastry chef. She knows what she's doing!!! There's not too many restaurant options here. But I guess they are opening new ones next year. But for now, you are basically stuck with either Beachcomber Cafe which is very good and Les Mutines by Guy Martin for dinner. Les Mutines was disappointing. I was expecting one Michelin star food like le 1947 at Cheval Blanc Randheli (I would actually give 1947 two Michelin stars), but the food came out to be Michelin Guide level which is a bit of a let down. The food is good but because it's posed as a signature restaurant for the resort, so I had higher expectations. Given Les Mutines is enclosed, I rather go to Beachcomber Cafe which most of the guests ended up doing. Beachcomber Cafe has excellent steaks. They import them from New Zealand and meat is very tender. In fact, Beachcomber has one of the best burger I ever had anywhere. Fish is also well cooked. We pretty much ended up eating at Beachcomber Cafe, Bob's bar or room service for rest of our stay on the atoll. I did go to spa daily because it was included in my package. I enjoyed the spa especially the facial. Unfortunately they did not have any male masseur and the two female masseuse I had were just adequate. They just didn't have the deep strength that I like. But for reference, I'm totally fine with my masseur walking on my back Thai style so others may find these masseuses more than adequate. The facility is nicer than the one at Four Seasons Bora Bora but not nearly as nice as the ones at Cheval Blanc Randheli. The service I feel is mostly good if not great with few exceptions. One time I wanted to ride my bike back to my room from Beachcomber Cafe. But I did not have my bike with me as I took the buggie. When I inquired if they can bring forth a bike so I can ride back to my room, the answer is it's not possible. Knowing that the resort was less than 50% full, the staff can easily fetch a bike from one of the villa next to the restaurant and lug it back later. If this was Eden Rock, they would say yes of course it is possible. While this is a very minor complaint but it illustrates that this particular staff had not been trained to go above and beyond the norm. On the other hand, when I wanted to watch sunset from the Beachcomber Cafe, two staff went out of the way to lug a comfortable beach sofa for us to sit on and even brought some drinks and snacks for us to snack on without us requesting them to do any of it. This is above and beyond what is called. I was thoroughly impressed. The best part of The Brando besides some of its staff is the atoll. We snorkeled with lots of fishes. We bird watched lots of birds including red footed boobies. We saw few sting rays and a manta ray within the lagoon. We took our first open ocean scuba dive lesson right outside the atoll. We even attempted to swim with a whale and her baby! I have to say the outdoor nature activities is what differentiate The Brando from all the other ultra luxury resorts I have ever been to. The atoll is stunningly beautiful. I have never experienced any place like Tetiaroa. The only place I can possibly imagine would be similar would be going to Galapagos Islands. However, I doubt we will find a resort as luxurious and as eco-friendly as The Brando on the Galapagos Islands. 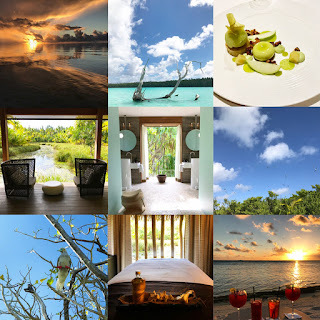 Overall the experience at The Brando was exceptional. I can see why they were ranked number two on Conde Nast's list. In order for them to be number one, I think all the staff needs to have Everything is Possible attitude that Eden Rock staff has. Some of the staff at The Brando have that attitude but not all. If they are able to get all the staff to go an extra inch for their guests, I can easily see The Brando take the crown and maintaining it. We will definitely be back. The beauty of this place can't be described with words and photos. Once you come, you will be like Leonardo diCaprio who pretty much makes a yearly trip to this magical place. We will be back. I hope soon.